When you’re pregnant, there’s a lot of lifestyle changes you may need to make in order to ensure you enjoy a healthy, happy pregnancy. It becomes important to start eating a healthy, balanced diet and to eliminate things such as smoking and drinking alcohol. However, one thing many pregnant women are unsure about is exercise. We all know that exercise is something we need to keep the body healthy. However, when you’re carrying little person inside of you, you also need to be careful to ensure nothing harms your baby. Exercise could be a potential risk to baby, but did you know it can also be extremely beneficial? Here, you’ll discover everything you need to know about exercising while you’re pregnant. From how much you should be doing to the best types of exercises to focus on and essential safety tips – after reading this blog you’ll know exactly what to do. Provided it is done correctly, exercise during pregnancy isn’t just safe, it’s beneficial for you and baby. As a general rule of thumb, if you were active and you exercised prior to the pregnancy, it’s going to be safe for you to carry on exercising. However, if you were inactive and barely exercised prior to the pregnancy, you will need to take extra precautions to ensure you don’t overdo it. Before starting exercise, it’s important to speak to your doctor or healthcare provider. They will be able to assess your individual circumstances and determine whether or not exercise is safe and if it is, how much you should be doing. It’s important to remember that during pregnancy, you shouldn’t exercise for weight loss purposes. Instead, you should focus on exercises which provide health benefits to you and baby. 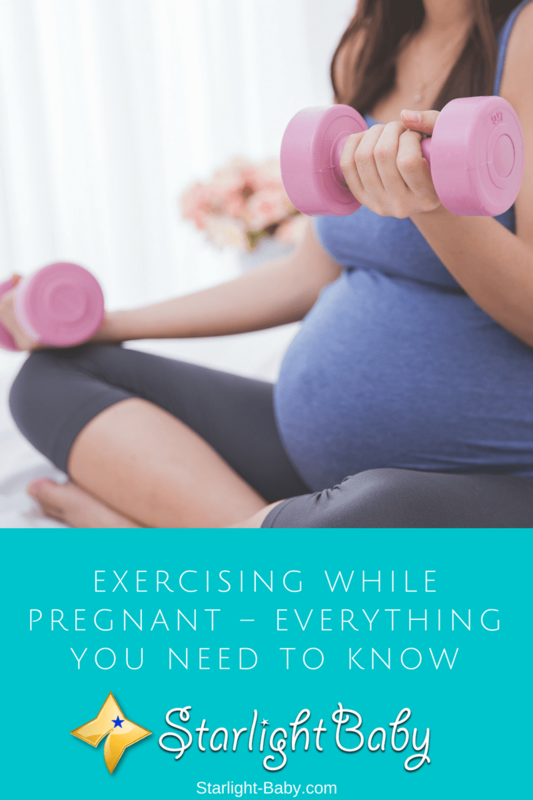 Exercise during pregnancy will not increase your chances of a miscarriage, unless you’re partaking in an intense form of exercise which could result in a fall or injury to the stomach. Exercise can prove extremely beneficial during pregnancy. Even just 20-minutes of exercise a day can provide great benefits to you and baby. However, ideally you’ll want to aim for 30-minutes (provided your doctor or healthcare provider approves). So, what benefits can you expect if you follow this advice? Well, studies have shown that physical activity during pregnancy can reduce the risk of gestational diabetes. Many women develop diabetes while they’re pregnant and it can be pretty tough to deal with. So, partaking in regular exercise can help you avoid this potential problem. It’s also going to reduce common pregnancy symptoms such as fatigue and backache. Carrying around a little person is hard work for the body! So, strengthening the back will help you to maintain good posture and reduce the risk of back-related problems throughout the pregnancy. It’s also going to help reduce stress, which is another common symptom you’ll experience during pregnancy. Regular exercise will also help to improve your sleep patterns. Many pregnant women find they are constantly tired and unable to sleep due to symptoms such as heart burn. Once baby arrives you’re not going to get hardly any sleep initially, so it makes sense to do everything you can to get plenty of sleep during the pregnancy. Perhaps one of the most important benefits, is that exercise can help you to increase your stamina and flexibility. Why is this so important? Because it’s going to really help to reduce the discomfort experienced during the birth. Finally, exercise during pregnancy can make it much easier for you to cope with the initial few weeks after baby is born. You’ll feel fitter and you’ll also find it a lot easier to shed your baby weight whenever you’re ready. Which Types Of Exercise Are Best For Pregnant Women? Prenatal yoga is especially common and offers a huge range of benefits. In particular, this is the exercise you’ll want to focus on if you want to make labor and delivery much easier. It helps to increase flexibility, as well as strengthen the entire body. So, consider taking a local prenatal yoga class. Swimming is a great cardiovascular exercise which works practically every muscle in the body. However, thanks to the water, it’s also gentle on the body too. So, while you’ll definitely feel it the day after, the exercise itself can prove gentle and enjoyable. If you love cycling, it might not be a great idea to head out on your bicycle while pregnant. However, you could take up indoor cycling on a stationary bicycle. This will give the legs a good workout and help to strengthen the lungs and the heart, while eliminating any risk to you or baby. Or, if you need some fresh air, why not head out for a brisk walk? These are just some of the best exercises you can do during pregnancy. So, what about the exercises you should avoid? The most important thing is to protect the stomach, so any exercise which could cause abdominal trauma should definitely be avoided. These are just some general guidelines. Your doctor will be able to provide you with more in-depth safety advice. Overall, exercising during pregnancy is usually safe and beneficial. However, it is important to follow your doctors advice and ensure you don’t overdo it. Since my wife had a history of miscarriage, the doctor advised us to be careful about performing heavy work out. Therefore, my wife did not do weight lifting bench press, push ups, sit ups etc. The best form of exercise was to walk. Every day my wife and I walked around 2 miles. I’m so sorry to hear about your family ordeal with miscarriages, it pains so much when you think the baby is well settled to grow till birth only to wake up one day and lose it over and over again. This shatters both the husband and wife. I’m glad she finally had her baby successful. Taking a long walk is actually a good exercise but most people think it’s not, it affects the entire body. Sorry to hear about the miscarriage, vinaya. Someone with a history of miscarriage is not advised to do strenuous exercises. Walking is fine and helps make the baby’s delivery faster and easier. As Martinsx said, a long walk is a good exercise. Great to hear you accompanied her during the walks. That’s so thoughtful of you. This is really a great article for any pregnant mother to come across, it’s definitely going to be helpful in helping her manage her pregnancy nature and have her baby in good condition and ready for delivery. It’s a sad thing that those with such health issues like Asthma, Diabetes,Heart Disease, Low placenta and a history of premature birth or miscarriage cannot participate in exercise because of the safety of their unborn baby. But generally, having a good amount of exercise prior to child delivery is very important because it helps a lot. This reminds me of a video I’ve recently watched of a male OB-Gyn who lets his patients in labor do a dance to help ease labor pains and pave the way for an easier delivery. It seems to be fun. The sure thing is to realize that exercising during pregnancy can be complicated, if the mother in question fails to talk to her doctor about whether it is needed or not. Exercising can also be a sure way to keep the body in shape and reduce cases of fatigue and tiredness at the end of the day. I totally agree with you on this @Henrywrites, even though exercise is good for one’s health, it’s a whole different thing when pregnancy is concerned. So it’s very important that one’s doctor is consulted to know the situation of the woman’s body and that of the pregnancy in order to be sure of what particular exercise that she is required to carry out. Once anything goes wrong, it’s the baby that is first at risk, followed by the mothers health as well. You got my point for I always tell people that are under certain conditions like being pregnant or sick to always take their time in visiting the hospital before embarking on some physical activity such as exercising. Yeah, exercising is good, but what works for one might not really work better for the other pregnant lady. Thus, the need to consult the doctor first. As long as you exercise and not overdoing it, I think is the best way out to keep either the baby or the mother healthy. As it prepares u for childbirth, it also endures and put you in better shape before your baby see the light of the world. Yes, it’s important not to overdo it. And before doing any exercise routine, the pregnant woman should consult her doctor first to ensure she is not at risk. Exercise is definitely beneficial for our body and overall wellbeing, but when you’re pregnant, you need to be extra careful. There are certain exercises which require a lot of strength and muscle, so it’s better to stay away from them, and do other easy but effective exercises like walking or cycling. When you’re working out intensely, whilst carrying a baby, you’re increasing the chances of potential harm to yourself and your baby. Yes, intense exercise could put the mom and baby at risk so the mom should be cautious. As I’ve mentioned above, it is important to consult the doctor first before doing exercises. The doctor could also advice of an exercise routine that is safe for both mother and baby. sport is very good for your body during pregnancy and it will ease your labor . I didn’t consult a doctor with regards to exercise. As long as you feel that you were fine and in good condition you can do whatever you wanted as long as it is not a heavy exercise just like walking. Doing it so especially the 8th and 9th month of pregnancy will really help you during childbirth.